Supermassive Black Holes May Be More Common Than Anyone Imagined : The Two-Way A black hole with about 17 billion times the mass of our sun has turned up in another remote galaxy. Astronomers now think these mass-eating monsters may not be so rare after all. 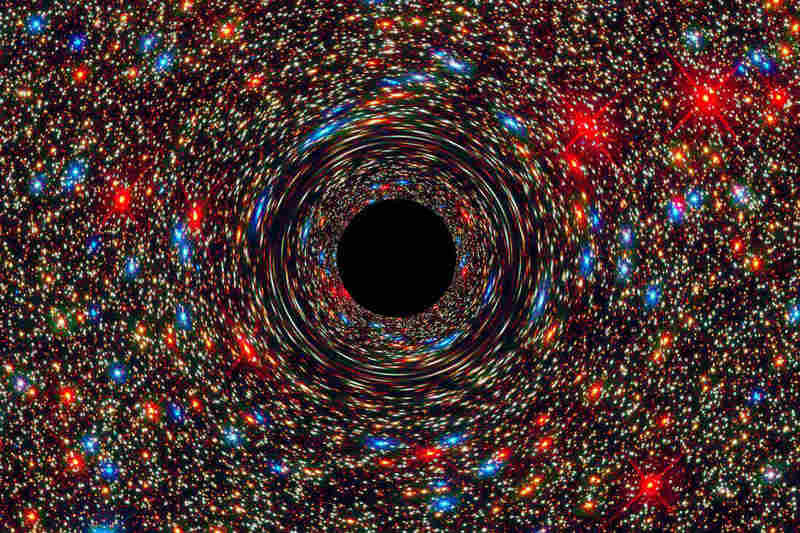 What's more, the center of this black hole's galaxy is strangely empty, says team member Jens Thomas, a research scientist at the Max Planck Institute for Extraterrestrial Physics in Garching, Germany. That scoured core of the galaxy also struck Gebhardt. "It's kind of like it's evacuating the center part of the galaxy," he says. "This is probably the most extreme example of that configuration." "And that's how you understand effectively where we come from — where the sun comes from, where the Earth comes from," Gebhardt points out. "What we're beginning to piece together is a model of the merger history of black holes throughout the universe."